As with all my flips, Flip 8 was in rough shape. There was deferred maintenance, dated design, neglected cleaning, broken appliances, and so much more. Of course, all those things are just opportunities to increase the value of the home. And in all my years of flipping, I’ve encountered rough & neglected houses before, but at Flip 8 I’ve encountered something I’ve never seen before. The elevator bathroom. 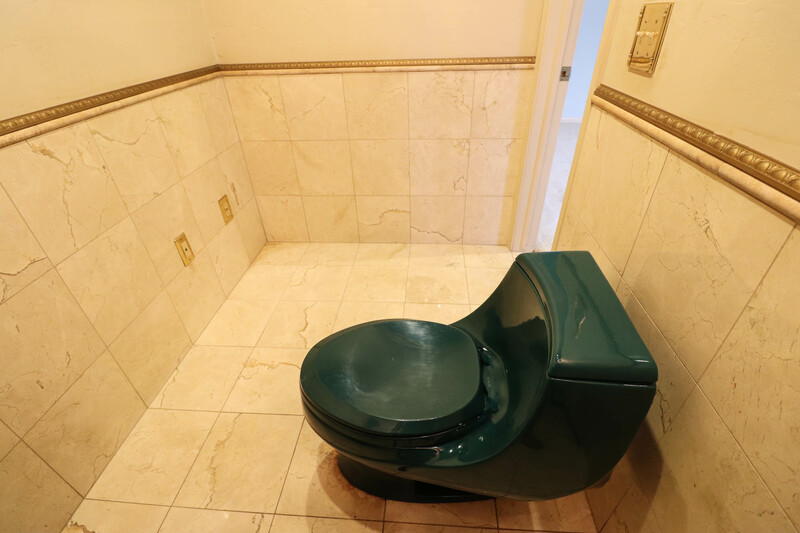 And it was in desperate need of a bathroom reno! No, it’s not really on an elevator, but take one step into the bathroom with its bold hunter green ceiling, gold filigree moldings, stone walls, and ornate design, and you’ll mistake the room for an elevator- according to my nephew. 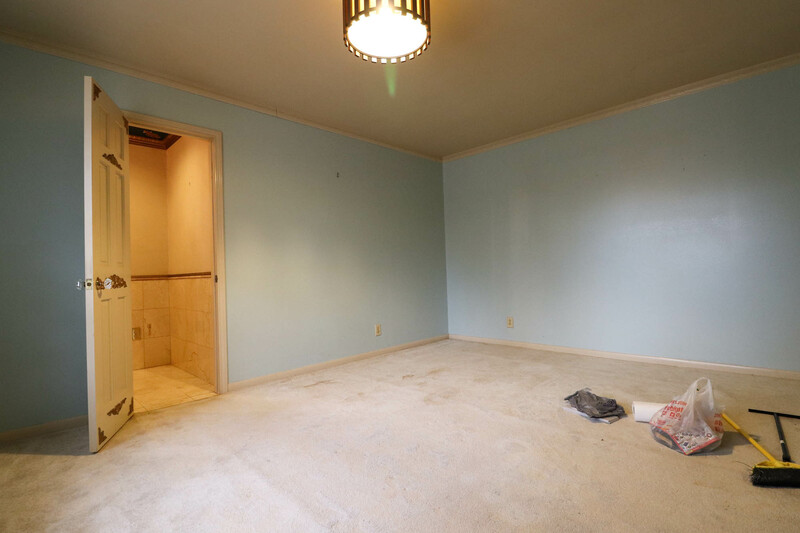 In its prime, this was a high-dollar bathroom! What will lovingly be dubbed The Elevator Bathroom is the focus of my continued collaboration with Jeffrey Court. You may remember that I partnered with Jeffrey Court to transform the sunroom at Flip 5! And we’ve teamed up again to bring a pretty incredible design to this bathroom! Not only have I never seen a bathroom designed like an elevator, but I also encountered another first with this bathroom. The bathroom used to be connected to the master bedroom as a master bathroom. 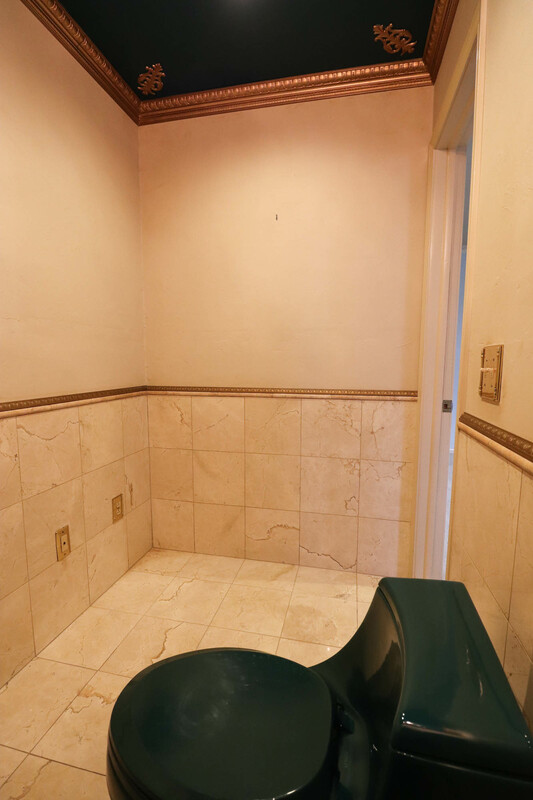 However, for reasons unknown, the previous owner decided to wall-off access to the master bedroom, remove the shower, and make the access via the dining room. 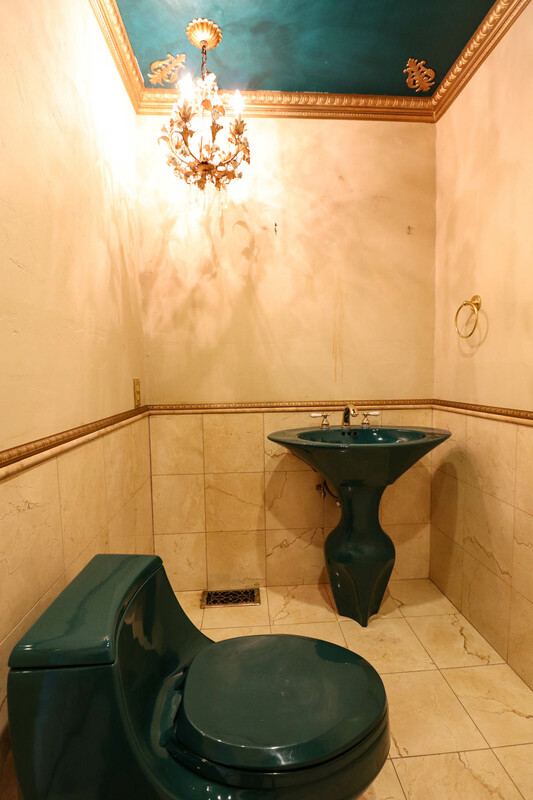 So what was once a ¾ bathroom was downgraded to a powder room off the dining room. That design choice is certainly a head-scratcher to me! In order to return function & value to the home, my plan is to convert this bathroom back to a master bathroom. I will be enclosing the existing door opening to the dining room, finding the original door opening to the master bedroom, and installing a shower where it once stood! This entire bathroom will be transformed in six short (okay, looooong) weeks. This is not just a bathroom refresh. This is a bathroom overhaul. We’re creating doorways, closing off walls, moving plumbing, gutting the room down to the studs, running electical, removing random phone jacks by the toilet, and, of course, tiling! Before we can get to the pretty finishes, a lot of demo has to happen! So stay tuned as this room gets taken down to the studs & transforms from an elevator bathroom to a stunning master bath retreat!